Clips and results from No Mercy this past Sunday. Dolph Ziggler heads to the ring with his newly won IC Title belt. He talks about giving himself only one option at No Mercy. He had thought that he might have made a mistake, but as soon as he stepped in the ring he knew he was home and would be walking out the IC Champ. The Miz and Maryse head to the ring. They stand quietly, in mourning for the IC Championship. This isn’t the end of the story though, it’s the start of act two. All great stories end the same way: the hero gets the gold and the girl. The Miz already has the girl. Now he wants his gold back. Ziggler, like a jerk, accuses Miz of crying. Miz doesn’t think that’s funny. He’s angry, and he’s not done with Ziggler. Neither are the Spirit Squad. Kenny and Mikey come out and cheer about a handicap match with Ziggler. I’m not really a fan of handicap matches, but this was fine. Ziggler moved around fast enough for it to make sense. He kept it mostly one-on-one. Immediately after the match, The Miz runs into the ring and attacks Ziggler. He’s about to triple-team Ziggler with Kenny and Mikey, but Heath Slater and Rhyno run out to make the save. The Miz and the Spirit Squad back off. Daniel Bryan and Shane McMahon talk about Survivor Series. They want to offer an opportunity as SS: a five-on-five Survivor Series match, RAW vs SmackDown. They also propose a 5-on-5 tag team match and a 5-on-5 women’s match. Earlier today, Renee Young asked Nikki about Total Bellas. Carmella, of course, attacked Nikki from behind. Not a bad match. Carmella attacked before the bell, so Naomi had to make a comeback. Nikki came out during the match which led to the finish, but it was still fine. It helped further the Carmella/Nikki feud as well as helped make Naomi look good with another win. After the match, Nikki tries to attack Carmella, but Carmella escapes. Andrea D’Marco asks Alexa Bliss about Naomi’s roll. Alexa isn’t worried about Naomi. Daniel Bryan walks up and asks Alexa if she can beat Naomi next Tuesday on SmackDown Live. Celebrating Eva Longoria for Hispanic Heritage Month. A pretty good match despite how short it was. Gable had a game plan, but the Usos had each other. I liked the finish, though it took me a second to realize what was happening. Mojo Rawley makes fun of Zack Ryder for playing with toys. The Ascension walks up, says nothing, and walks away. AJ Styles heads to the ring. He knows that the fans live vicariously through him, but there’s only room for one on his bandwagon. He tells the fans to go cheer for Cena or Ambrose. By the way, he beat Cena and Ambrose at the same time. Most champs who did that would take some time off, but not Styles. He tries to bring out his opponent for tonight, but Dean Ambrose comes out instead. Ambrose says he’s not done with Styles and no one on the roster will jump past him in line. Styles says his opponent tonight isn’t on the roster. He brings out James Ellsworth. He then tells Ambrose to go away, but Ambrose wants to watch the match. Daniel Bryan comes out. Bryan reminds Styles that he makes the matches on SmackDown. 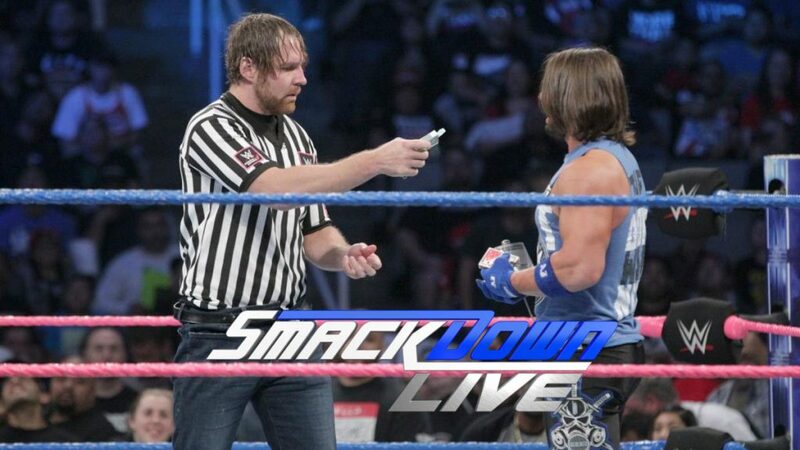 He agrees to the match with Ellsworth, but he puts Ambrose in as the special referee. This was pretty amusing. A nice comedy diversion. It’s interesting that they’re adding so much comedy to Styles’ title reign. Randy Orton walks in the back. He finds Kane and asks him to live in Orton’s world for a while. Kane agrees, but tells Orton he has issues. AJ Styles is furious and yells at Daniel Bryan. Shane tells Styles to calm down. Bray Wyatt and Luke Harper head to the ring. Harper says that he has seen the light. Wyatt tells Orton to bring his monster. Wyatt has brought his. Good match, though there was a strange segment where Orton got distracted by Kane and Harper at ringside, and the ref only admonished Kane. It was odd and made it very obvious that something was about to happen. The ending was also more mind games and magic, but I think this worked a little better than the backstage stuff they’ve been doing for weeks. Good show. The big feuds all entertained tonight, the women’s stuff maintained interest, and the tag stuff did as well. Despite the weirdness and magic ending, I think this one kept my interest the most. The Styles match was amusing, but I consider it more of a comedy act than an actual match.